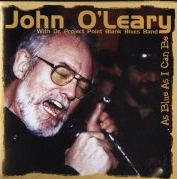 "……….Here we have John O’Leary, veteran harp player with Savoy Brown, The John Dummer Band and The Brunning/Hall Sunflower Band teaming up with a group of accomplished musicians from Belgrade. They consist of Dr. Project on guitar, Darko Grujic on keyboards, Zoran Milenkovic on bass and Jovan Pejcinovic on drums. If you don’t know, there is a healthy interest in blues and rock in Eastern Europe with a strong following in Poland and Hungary as well as in the former Yugoslavia.